The White House recently raised the prospect of legal immigration to the United States by about one half, primarily based on cuts in family visas. These moves are in line with the RAISE Act proposed by Senator Tom Cotton, which would eliminate the ability of citizens and to sponsor adult relatives including parents and children, and would drastically reduce the cap for Legal Permanent Residents (LPRs, or green card holders) from 226,000 to 88,000. How might Asian immigrants be affected by these changes? 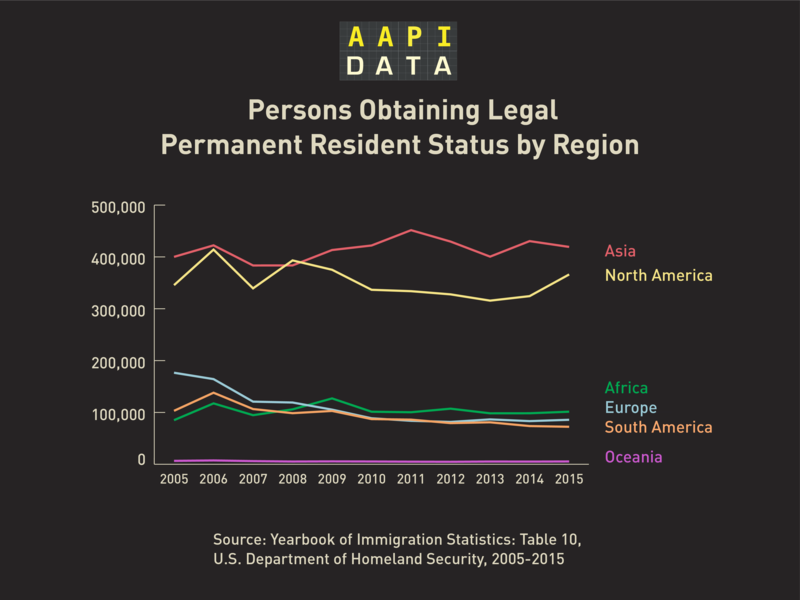 First, it is important to note that, over the past decade, the largest number of green cards issued by the United States has gone to immigrants from Asian counties, with nearly 420,000 Asians obtaining legal permanent resident status in 2015, the latest year for which we have data available. So, any move to cut legal immigration by a half is very likely to reduce immigration from Asia. Some might argue that the Trump administration’s proposed point-based system will disproportionately help Asian immigrants, given their high level of representation among immigrants in the information technology and health sectors. It is true that immigrants from Asia account for the majority of employment-based visas (89,533 out of about 144,047 in 2015). However, these visas still pale in comparison to the number of family visas given to Asian immigrants (about 239,000 family-based visas to Asian immigrants in 2015 compared to about 90,000 employment-based visas). In addition, the point-based system would not increase the number of employment-based visas and, indeed, would raise barriers even higher than they are today. 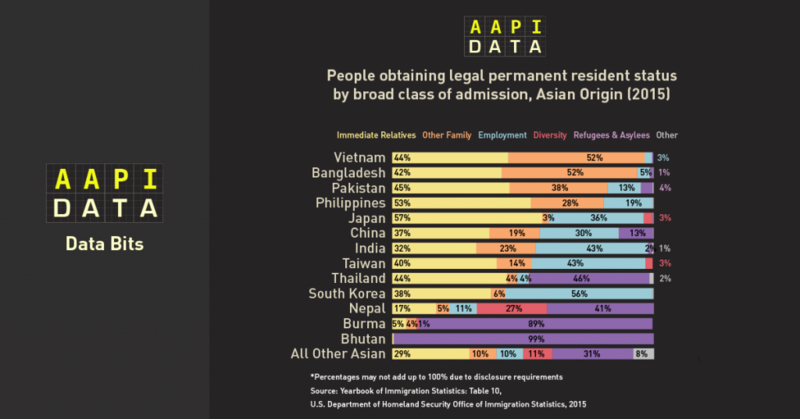 By making it more difficult for professionals to immigrate to the United States, and more challenging for green-card holders and U.S. citizens to sponsor their family members, the United States will likely see significant decline in Asian immigration, including among the very professionals the country wishes to attract. In addition, capping family visas will likely worsen the problem of long waiting times and visa backlogs for Asian immigrants, and will likely increase the number of undocumented Asian immigrants in the United States, who are already at 1.7 million. Trump’s proposed cuts to legal immigration will also mean significant declines in migration from China, India, and the Philippines. 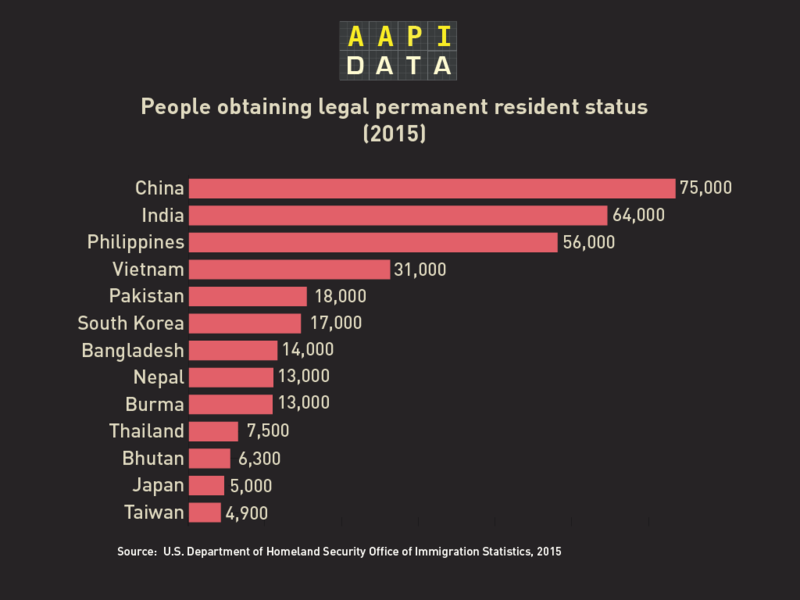 These three countries accounted for over 195,000 of those granted legal permanent status in 2015, or close to one half of all Asian legal permanent residents admitted that year. Finally, the Trump administration’s proposed cuts will disproportionately hurt immigrants from many Asian countries. In 2015, family-related visas accounted for the overwhelming majority of people obtaining legal permanent resident status from Vietnam (96%), Bangladesh (94%), Pakistan (83%) and the Philippines (81%). And even among countries such as China and India with a sizable number of employment-based visas, more than half the green cards issued in 2015 were issued on the basis of family-related preferences. To sum up, Asian immigrants and their families stand to lose tremendously under President Trump’s proposed revisions to legal immigration. 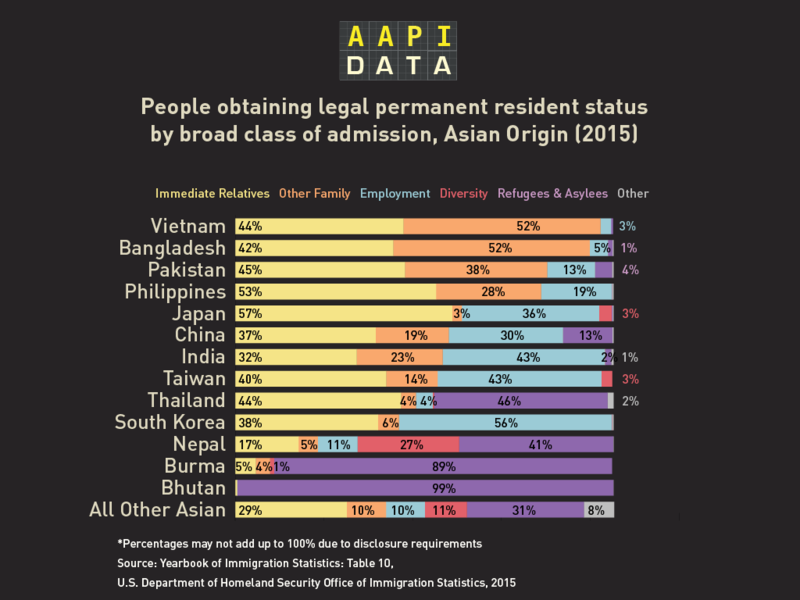 The high number of Asian undocumented immigrants in the United States is related to the long wait times for family visas—which already stretch over 20 years for relatives from the Philippines—and to large visa backlogs from Asia, with backlogs from the Philippines, India, Vietnam, China, Bangladesh, and Pakistan now total over 1.5 million. By proposing even more restrictions on family visas, the Trump administration will likely exacerbate the problem of Asian undocumented immigration in the years ahead.